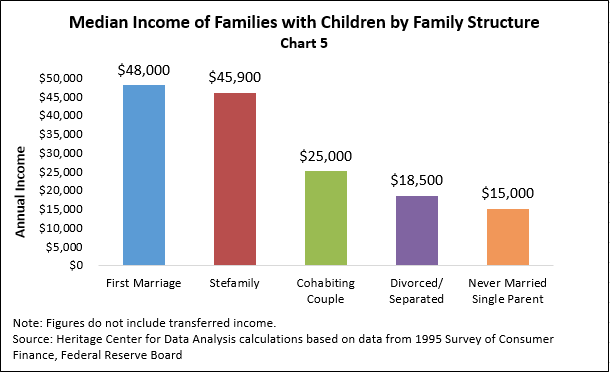 Family structure has much to do with income levels and asset building, both of which lead to economic prosperity. A family’s income is used to finance immediate needs and, if it is sufficient, may allow the family to save for future needs. There are two elements in the amount of income received: the dollar value of hours worked and the number of hours worked. These in turn are affected by, among other things, the parents’ education level and work habits that typically are formed in the early years. The marriage of the parents has much to do with a child’s educational attainment and work ethic. The relationship can be expressed as an equation: Income = (education attained) x (work ethic) x (unity of family structure). The fraction of college graduates in a geographic area has a smaller but still positive, precisely determined influence on employment when controlling only for demographics and education, but the influence is indeterminate under controls for earnings. Presumably, once the human capital and credentialing effects of higher education are absorbed and accounted for by earned income itself, college has little otherwise specifiable effect on employment propensity. As mentioned above, this is not the case with high school: High school drop-outs behave very differently with respect to employment than those with high school diplomas. Income level itself has a less precisely determined but otherwise positive relation to employment. The fraction of Hispanics in a geographic area has a modest, positive, and precisely determined influence on the employment rate among 25- to 54-year-old males under all controls. Hispanics in a geographic area tend to work more, or they seek those areas with work more readily than others do, or both. Blacks have no precisely determinable influence on employment rates in an area once other controls4) have been implemented. The minor dependency ratio (more children present) has a large, positive, precisely determinable influence on men working. Presumably these men are working to support those additional children. The minor dependency ratio in a geographic area also has the largest consistently positive influence on average earnings for males aged 25 to 54.5) The influence of minor dependency is large, positive, and precisely determinable under controls for demographics, education, and earnings levels (of the whole adult population). Of course, one does not obtain an adequate and steady income just by marrying. Increasing the number of hours worked at a job valued by the marketplace will provide more income. 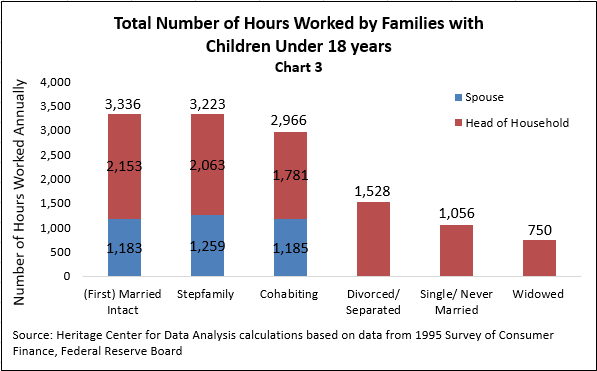 The number of hours worked is linked directly to educational achievement and family structure (See Charts 1 and 2). Families whose members have lower levels of education normally will have to work longer to reach a modest level of financial security than do those whose members achieve higher levels of education. 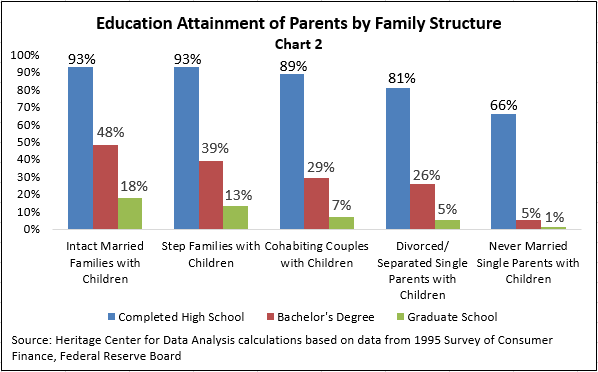 Although the income of a family household depends on the educational level of parents, it is the parents’ income rather than their level of education that predicts more accurately the level of education their children will achieve.8) In general, children with high-income parents receive more education than do children of lower-income parents.9) But higher income is less likely without marriage (see Chart 5), and poverty is much more likely without marriage. A significant portion of two-parent families have moved out of the poverty range because both parents work, which also increases—and in many cases doubles—the total number of hours worked within the household. Among America’s poor, there has been a significant shift in the number of hours worked per household, which indicates that much of the disparity in young men’s economic status is concentrated in the number of hours worked. In 1960, nearly two-thirds of households in the bottom quintile of income were headed by individuals who worked—primarily married fathers. By 1991, this figure had fallen to around one third, and only 11 percent of these households were headed by someone who worked full-time throughout the year. 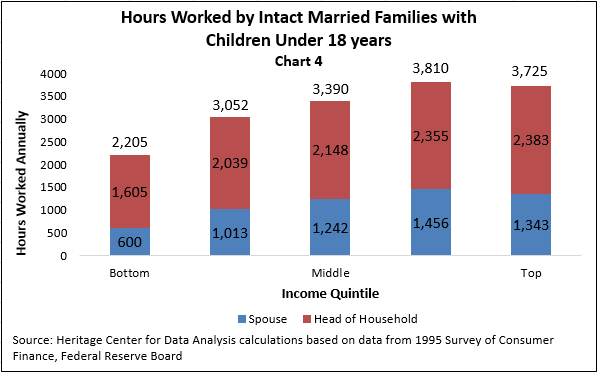 The total number of hours worked in married households has increased significantly over the past 40 years. According to former Congressional Budget Office Director June O’Neill, in 1950 only 18 percent of married mothers with children under 18 worked outside the home. By 1975, 41 percent of married mothers worked and that proportion reached 64 percent in 1992. Yet mothers on welfare appear to work little—only 7 percent report any employment. These data were collected before the enforcement of the Welfare Reform Act (1996). Not only are those in the lowest quintile generally working fewer hours than their counterparts were in the 1950s and 1960s, but they are doing so despite a national family trend in the rising number of hours worked. A reverse trend accompanies the disappearance of marriage: The number of hours worked in the family household declines. Present-day single heads of households are working fewer hours than the married heads of poor households in the 1950s (typically, married men). At the same time, married couples are increasing the total number of hours worked, and although there are some unwelcome consequences from this increase in working hours in married households, there is no doubt that it has increased the number of families exiting a life of poverty. 2) Henry Potrykus and Patrick Fagan, “U.S. Social Policy Dependence on the Family, Derived from the Index of Belonging,” (2013). Available at http://marri.us/policy-2013. 3) This is interesting given the emphasis by some on education when the health of the American workforce is discussed. Family, heretofore ignored in this discussion, must be given equal footing. If we are concerned with the American workforce, the family must be discussed side-by-side with education. See, again, Heckman and Masterov, Cunha and Heckman, “Formulating, Identifying and Estimating the Technology of Cognitive and Noncognitive Skill Formation,“ and Armor. 4) See Table 2 in Henry Potrykus and Patrick Fagan, “U.S. Social Policy Dependence on the Family,” (January 2013) available at http://marri.us/research/research-papers/u-s-social-policy-dependence-on-the-family/ for a list of the controls and other methodological considerations. 5) The fraction of intact families in a geographic area has the largest consistently positive influence on average earnings under a model without the dependency ratio controls. Hence, we assert that this is a “family effect” most properly attributable to care for dependents. Endogeneity is partially broken by our multi-model specification. 6) Hence, this may be a phenomenon of where the minorities tend to work and not a function of minorities' pay levels themselves. This is a subtle matter touching on the ecological inference problem. 7) Susan J. Popkin, “Welfare: Views from the Bottom,” Social Problems 37, no. 1 (1990): 64-79. 8) M. S. Hill and G. Duncan, “Parental Family Income and the Socioeconomic Attainment of Children,” Social Science Research 16, (1987): 39-73. 9) , 10) , 14) Martha S. Hill and Jodi R. Sandfort, “Effects of Childhood Poverty on Productivity Later in Life: Implications for Public Policy,” Children and Youth Services Review 17, no. 1 & 2 (1995): 91-126. 11) Hsiang-Hui, Daphne Kuo,and Robert M. Hauser, “Trends in Family Effects on the Education of Black and White Brothers,” Sociology of Education 68, (1995): 136-160. 12) Darin R. Featherstone, Bert P. Cundick, and Larry C. Jensen, “Differences in School Behavior and Achievement Between Children from Intact, Reconstituted, and Single-Parent Families,” Adolescence 27, no. 105 (1992): 1-12. 13) Herbert Zimiles and Valerie E. Lee, “Adolescent Family Structure and Educational Progress,” Developmental Psychology 27, no. 2 (1991): 314-320. This entry draws heavily from How Broken Families Rob Children of their Chance for Future Prosperity.